It’s Da Chick’s 6th birthday tomorrow. 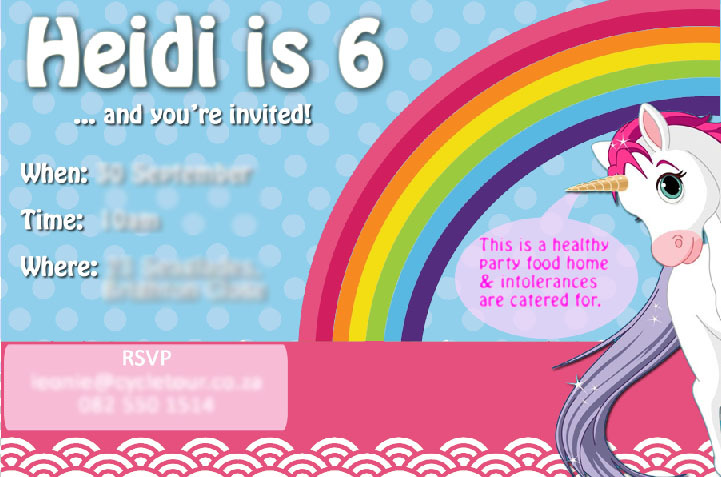 My life has been a little chaotic lately and it’s a miracle that I even managed to design, print and send out her party invitations. Due to my current schedule, I’ve been doing some serious under-parenting, so I decided move my swim session from Thursday to Wednesday (tonight) and take tomorrow off to do all the necessary party decor and catering ingredients shopping. This means that after a full morning’s training on Saturday, I’ll still need to set up and cater for a 6th year old birthday party for Sunday, AND I have to keep it a secret that my best friend (their godmother) will fly in on Sunday morning to be here for the party (which means stocking up on extra wine and baking her favourite cakes too). So I got home tonight (still in my swimsuit, wet and with a towel wrapped around my waist), lugged my laptop bag, handbag, paperbag filled with ingredients for the gluten-free cupcakes for tomorrow’s class party, and my gym bag through the front door, and came face to face with a little girl crying behind the couch, Da Son looking particularly miserable and Da Husband looking slightly confused and uncertain of how to deal with little people and big emotions. After some gentle coaxing, it emerged that Da Son had a bad day at school and Da Chick is sad that her grandfather (my dad passed away two months ago) won’t be here for her birthday tomorrow. Tomorrow also happens to be grandparents’ day at her school, and it will be the first time that my dad won’t be there (instead, my mom will bring my gran) for her. It was pretty much at that point that I realised that this was going to be a looooooooooooong night, and that the cupcakes would have to wait because my children needed their mommy to be there for them… So I read them a little story and we had a chat about our feelings. And then they dropped the bombshell: They were also sad that I spent all my time away from them, either working or training, when all they want is to be with me. It’s on days like these when all this juggling is hard. When balancing being a good wife and mom, training, spare time, work commitments and the semblance of a social life – all at the same time – becomes a challenge. It’s hard to see how the household just isn’t quite the same – how things just don’t quite run as smoothly – when you’re not around to keep tabs on things. … I am, in actual fact, struggling to cope with all the demands placed upon me right now.